⑴Standard charge: Under temperature 20±5 ℃, charge with 1I3 constant current till it reaches ( to) charge cut off voltage,(4.2V*n , among which , “n “is the number of single cells of the battery pack .) then starts to Charge with constant voltage, Till charge current<0.01C. Avoid over discharge, the battery should be charged once every 30 days when preserved. (1) Be sure to charge the new battery fully before using for the first time .The battery will reach its max capacity after 3-5 times of full charging and discharging . (2) When the battery is powered off, an immediate charging is needed, which will greatly help extend the battery’s cycle life. Otherwise , it will affect the longevity of the battery .If need to store the battery for long time , had better keep the battery half charged state and charge it for around one hour every other month . (3) When start the electric appliance , please start slowly little by little . Better assist it with accessory power to decrease the starting current and decrease the startup burden accordingly ,which will benefit the battery longevity etc . (5) The best working temperature of the battery is 15℃-40℃ .Otherwise ,it will affect the battery’s normal performance . The direct embodiment is the change of the battery capacity or the working time of the electric equipment , which is the normal . 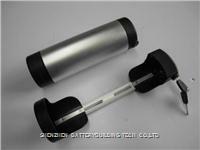 (6) If the environment temperature is above 40℃,the battery’s longevity will be shorten. Therefore in hot summer day, don’t expose the battery in strong direct sunlight. (7) If the temperature is at/below -10℃, the battery’s performance will also be affected and (in this situation ),maybe only 60% of the capacity can be outputted .As a result ,the working time of the e-equipment in winter will be much less than that in Summer The battery should be stored and charged in the room in winter. When charging , if the indicator to show the full charge is on , you can stop charging the battery . (8) Don’t wash the outer shell of the battery with impregnant .In case of fire please use Carbon Chlorin or sand &earth to put out fire instead of CO2. In case of leakage, heat, fire, performance decrease etc , please use the battery according to the following regulations .Our company won’t take any responsibility for any mis-operation not according to this specification. (1) First plug the input end of the charger into the battery charging socket , and then connect with AC power . (2) When charging, it is normal when the red indicator is on . When the green indicator is on ,the battery is fully charged and at this time , you can stop charging the battery . (3) After finish charging , please disconnect the plug with the AC power first and then disconnect the plug connecting with the battery . (4) It is prohibitted to connect the idle charger (when not connecting it with the battery) with ACpower supply for a long time. (5) It is allowed to charge the battery either taking it off the electric appliance or directly on the e-appliance. (6) When charging the battery directly on the electric appliance , please don’t start the electric equipment in case of the damage of the charger . (7) Please charge the battery in a ventilated place far away from fire. Use matchable proper charger always. 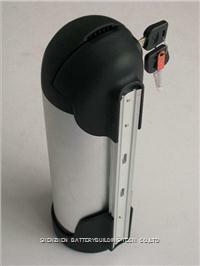 (8) For the sake of safety, be sure to charge the battery where children can not reach. (9) Handle with care, do not shake. (10) Don’t immerge the battery in the water or other liquid, in case of damp .Especially on rainy days , take care to prevent the water from going into the controller and motor ,in case of short- circuit . (11) Avoid being short-circuited , connecting the anode and cathode . (12) Don’t dismantle the battery, as that may cause inner short-circuit and then decomposition of the inner material, fire and even explosion accordingly. In addition , dismantling the battery may cause the leakage of the electrolyte ,which will do bad to the human body . .If the electrolyte isspattered onto skin , eye and other part of the body , please wash with clean water immediately and go to the doctor at once . (13)If the battery is damaged, distorted or there is leakage of the electrolyte or the taste of electrolyte and some similar abnormal phenomena ,don’t use the battery any more . .Please deliver that to the factory service centre or relevant organization for proper disposal . In addition , battery with electrolyte leakage should be far away from fire ,in case of explosion . (14) battery replacement The battery provider should be responsible for replacing and installing the battery .The consumer shouldn’t replace that at will. (15) dismantle without permission The consumer shouldn’t dismantle the battery at will .Or our company won’t take any responsibility. (16) When using the battery , the consumer need to discharge the battery to the low voltage of the controller , then charge it with the matchable charger . 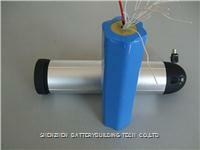 (1) The battery is suitable for being transported by truck , train , plane . During transportation, please avoid solarization ,drench and serious shake . (2) The battery pack must be packed with insulated material and marked with logo of frangibility in case of any damage caused by bumping in transit. (3) Don’t upside down the battery. A sticker indicating’Don’t upside down’ is needed. Also can’t be put at will . (4) Handle with care in transit. Can’t throw or impact the battery. (5）Don’t place any heavy objects on battery pack in case of the damage of the battery pack because of the impact. (6) Don't mix-transport with flammable or explosive consignment, or metal objects with sharp end. (7) Outer packing should be marked ‘Away from moisture, water, and fire’.